I've been coloring poppies. Lots of poppies. 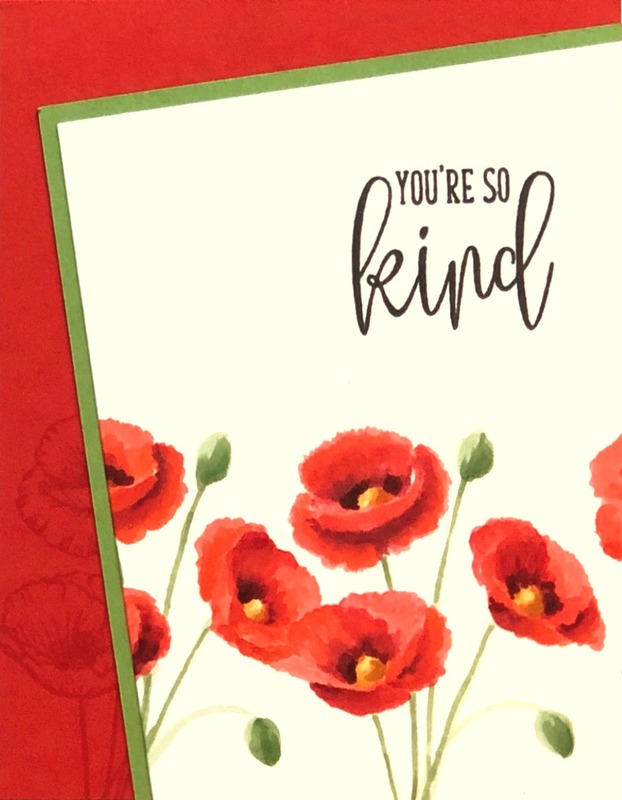 I recently received the stamp set Inspiring Poppies by Gina K. Designs. It's a wonderful little mini set, and it's so fun to color. 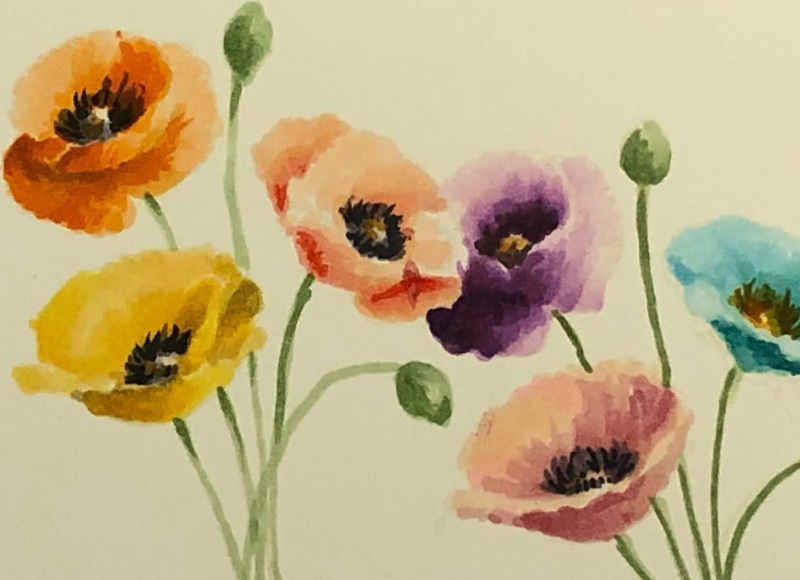 Poppies are such a simple and timeless wildflower that come in a variety of colors, so it's really fun to experiment with. Recently I shared this thank you card I'd made using this stamp set on Instagram and on Facebook. In the day or two following that post, I received several requests for the markers I used and/or a no-line coloring tutorial, so I decided to make a short video of my coloring process. My process begins with practice. I like to stamp my floral images in black ink, then first make a shading guide by shading with pencil. Using pencil only, this allows me to map out my areas of contrast that I need to create a dimensional look. I can practice several times this way, testing out pattterns of light and shadow, and using different directional light sources before I begin to start using color on a "real" panel. To do no-line coloring, instead of stamping with black ink, use a very pale color of ink that will get covered up with your coloring. That is how you get "no-lines". choices could be a very pale pink or blue that you "stamp off" first onto a piece of scratchaper, removing a bit of the ink first on the scratch paper before you stamp onto your card panel. A great option is Fade Out ink, made by Inkon3. It's a very neutral pale gray ink, that virtually disappears under even the palest marker. 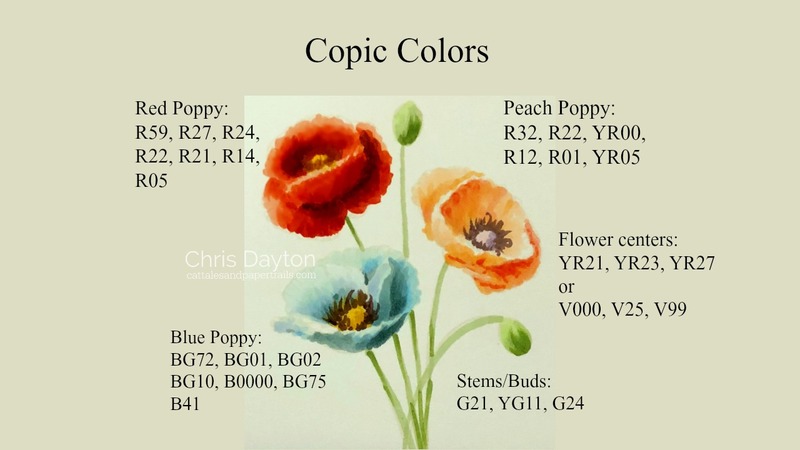 I used Fade Out ink on this practice color sample where I was experimenting with several different colors of poppies. I used my Original MISTI to stamp onto Hammermill 100# Digital Color Copy Cover paper. This paper is my go-to for Copics, as it's very easy to blend on, a nice layering weight, and is very inexpensive. I never feel bad about doing lots of practicing with this paper, as it's so very reasonably priced. I like to start with my darkest tones first then work toward the lighter areas. Putting those darks in first, helps me see the shape of the flower right away, and I'm less likely to "lose" some of the petals as I add color. Thanks for watching and visiting today! I hope you enjoyed the video and feel inspired to try a handful of colors on your favorite floral image. Edited: I realized that Inspiring Poppies is currently out of stock at Gina K. Designs. If you are interested in this stamp set, Gina usually has stamps available within 2 weeks. Really Really love this and your teaching is great! Thanks for sharing. Wow! You really have an "eye" for knowing how to color to make the flowers have so much dimension! AMazing. Thanks for the tutorial! Loved your video! You are so talented! Your coloring and explanation of how and why you choose your color choices. Hope you do more videos. Beautiful coloring! Great video. You have nice voice to listen too and your tips are very helpful! Thanks! Great video, Chris! I had forgotten your tip about penciling in the shadow areas first - I need to remember to do that! These poppies are gorgeous! This is wonderful, Chris. Thanks for sharing your magic with us. Keep those videos coming!! ❤️ ❤️ ❤️ these poppies!! !